Today, almost half of the world's workers - 1.5 billion people - work in water related sectors and nearly all jobs depend on water and those that ensure its safe delivery. Yet the millions of people who work in water are often not recognized or protected by basic labour rights. The theme in 2016 — water and jobs — is focusing on how enough quantity and quality of water can change workers' lives and livelihoods - and even transform societies and economies. World Water Day is an annual event celebrated on March 22. The day focuses attention on the importance of freshwater and advocates for the sustainable management of freshwater resources. This day was first formally proposed in Agenda 21 of the 1992 United Nations Conference on Environment and Development in Rio de Janeiro. In 1993, the first World Water Day was designated by the United Nations General Assembly and since, each year focuses on a different issue. The UN and its member nations devote this day to implementing UN recommendations and promoting concrete activities within their countries regarding the world's water resources. Additionally, a number of nongovernmental organizations promoting clean water and sustainable aquatic habitats have used World Water Day as a time to focus attention on the critical issues of our era. Events such as theatrical and musical celebrations, educational events, and campaigns to raise money for access to clean and affordable water are held worldwide on World Water Day, or on convenient dates close to March 22. The occasion of World Water Day is also used to highlight required improvements for access to WASH (water, sanitation, hygiene) facilities in developing countries. Each year World Water Day is celebrated to show the importance of water on the globe, and each year there is an annual theme. 2016: Water and Jobs ("Better water, better jobs") - This theme shows the correlations between water and jobs created either directly or indirectly by water sources on the globe. 2015: Water and Sustainable Development - Under the theme ‘Water and Sustainable Development’, the year 2015 provides an important opportunity to consolidate and build upon the previous World Water Days to highlight water's role in the sustainable development agenda. 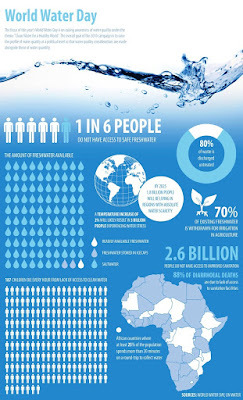 UN-Water supports the World Water Day campaign and sets the theme each year. At the World Water Week 2014, UN-Water presents the plan for the World Water Day 2015 campaign, which is coordinated by UNDP with the support of WWAP, UNESCO, HABITAT, UNEP, The World Bank and UN-DESA. Participants will get an opportunity to learn more about the theme of World Water Day, get the latest update on how the international community perceives water's role in the post-2015 framework and will be invited to get involved in the campaign. In addition, participants will also discover the logo of the World Water Day 2015.